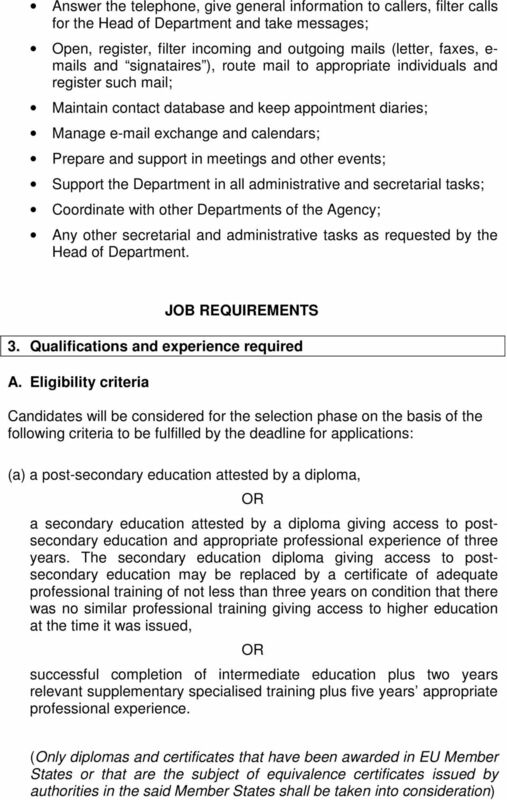 Download "Vacancy Notice Personal Assistant Ref. n : CA-PERSA-FGII-2010"
3 (b) Thorough knowledge of one of the official languages of the European Union and a satisfactory knowledge of another of the EU official languages; Furthermore, in order to be eligible candidates must: Be a citizen of one of the Member States of the European Union; Be entitled to his/her full rights as a citizen 1 ; Have fulfilled any obligations imposed on them by the laws on military service; Be physically fit to perform the duties linked to the post 2 ; B. Selection criteria Essential Candidates selected on the basis of the above eligibility criteria will then be evaluated according to the following selection criteria: Relevant professional experience of at least two years in the areas mentioned above under Job Content ; High sense of discretion and confidentiality; Excellent ability to communicate and deal courteously with people, excellent service orientation; Ability to take initiatives, to work both independently and as part of a team; Ability to perform duties with speed and accuracy and to work under pressure; Good capacity to focus on priorities, flexibility and punctuality; Computer literacy and in particular a good knowledge of MS Outlook, MS Office and Internet; Experience in planning and time management; Good command of spoken and written English. Advantageous The following characteristics will be considered as additional assets: 1 Prior to appointment, successful applicants will be required to produce an official document showing that they do not have any criminal record. 2 Before being engaged, a member of the contract staff shall be medically examined in order that the Agency may be satisfied that he/she fulfils the requirements of Article 83 of the Conditions of Employment of Other Servants of the European Communities. 4 Professional experience in multicultural/multilingual environments; Knowledge of the EU administrative and financial procedures and terminology; Knowledge of German. SUBMISSION OF APPLICATIONS Candidates are requested to submit their application electronically through the Agency s website: Only online applications will be accepted. An application will be deemed admissible only if it includes a motivation letter (preferably no more than one page) a CV in Europass format (other formats will not be considered) and an eligibility and selection criteria grid. 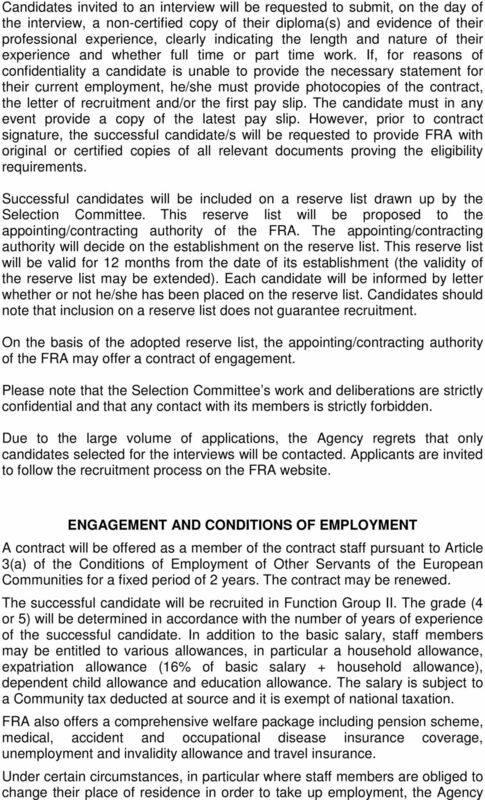 Information concerning the status of the selection procedure can be found at the following address: EQUAL OPPORTUNITIES The FRA urges anyone meeting the eligibility criteria and interested in the position to apply. 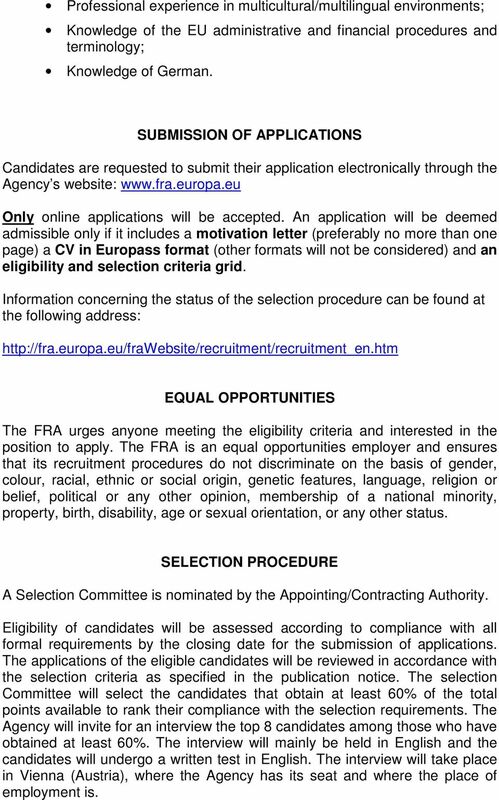 The FRA is an equal opportunities employer and ensures that its recruitment procedures do not discriminate on the basis of gender, colour, racial, ethnic or social origin, genetic features, language, religion or belief, political or any other opinion, membership of a national minority, property, birth, disability, age or sexual orientation, or any other status. SELECTION PROCEDURE A Selection Committee is nominated by the Appointing/Contracting Authority. Eligibility of candidates will be assessed according to compliance with all formal requirements by the closing date for the submission of applications. The applications of the eligible candidates will be reviewed in accordance with the selection criteria as specified in the publication notice. The selection Committee will select the candidates that obtain at least 60% of the total points available to rank their compliance with the selection requirements. The Agency will invite for an interview the top 8 candidates among those who have obtained at least 60%. The interview will mainly be held in English and the candidates will undergo a written test in English. 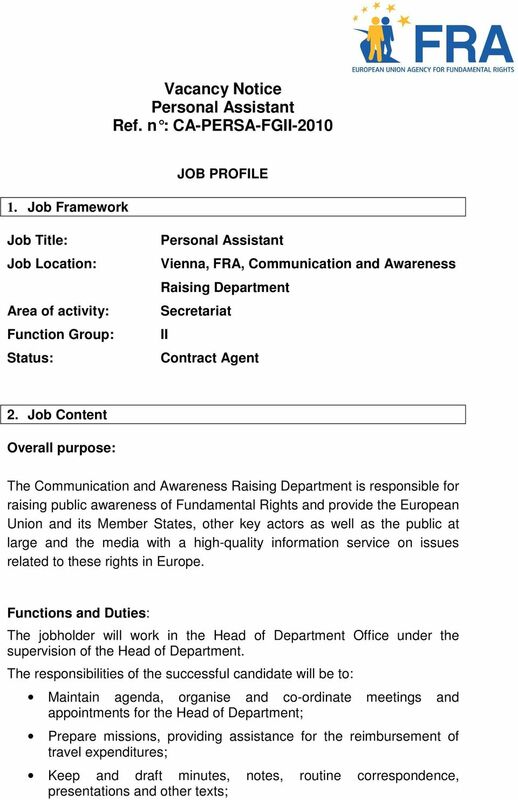 The interview will take place in Vienna (Austria), where the Agency has its seat and where the place of employment is. 7 3e1c3319b03eb DEADLINE Applications must be sent no later than 15/03/2010 at 13:00 (Local time, GMT +1). Please note that due to the large number of applications we receive, the system may face problems in processing such amounts of data when reaching the deadline for submission of applications. We therefore advise to apply well ahead of the deadline. Vacancy for a post of Document Management and Data Protection Officer (Grade AD 5) in the European Asylum Support Office (EASO) REF. 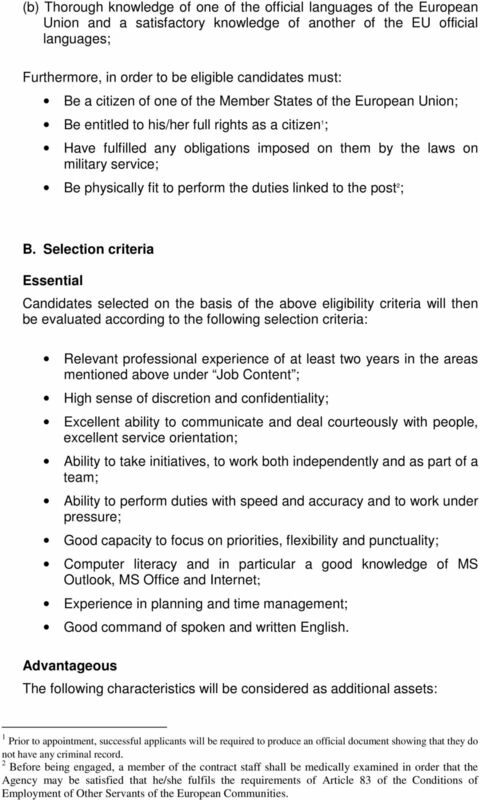 Vacancy for the post of an Information Technology Assistant (Contract Agent FG III) in the European Asylum Support Office (EASO) REF. VACANCY NOTICE. Fusion for Energy seeks to establish a reserve list for the profile of Enterprise Resources Planning (ERP) Senior Specialist. Vacancy for a post of Information Officer - COI (Temporary Agent, AD 5) in the European Asylum Support Office (EASO) REF. Official Journal C 323 A. of the European Union. Information and Notices. Announcements. Volume 58. 1 October 2015. English edition. VACANCY NOTICE. Fusion for Energy seeks to establish a reserve list for the profile of ICT Software Engineer. 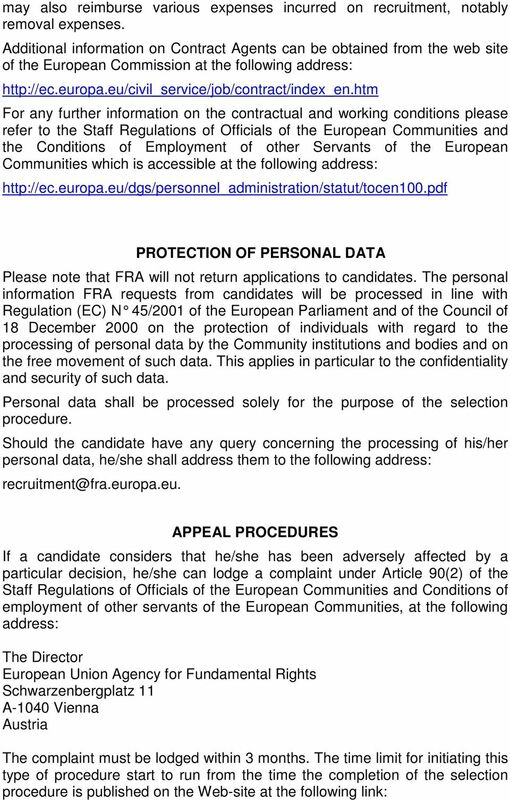 Call for expression of interest for the establishment of a reserve list for the positions of. Technical Specialists in profiles: Market Analyst. Applications are invited for the above Contract Agent post at the European Centre for Disease Prevention and Control (ECDC). The Joint Technology Initiative will engage up to 3.7 billion for the period 2014 2024. Tallinn, Estonia. Regulation (EU) No 1077/2011 of the European Parliament and of the Council of 25 October 2011, OJ L 286, 01.11.2011. Clean Sky 2 Joint Undertaking traineeship programme Support to Human Resources and Secretariat activities.